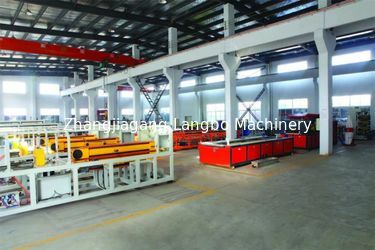 ZHANGJIAGANG LANGBO MACHINERY CO., LTD. is leading company offering quality machinery for a wide range of plastic extrusion and recycling processes from China. Due to our constant commitment to plastic extrusion and recycling technology, we have emerged as a leading manufacturer of machinery for PVC/PE/PP-R pipe, PE/PP-R composite multi-layer pipe, PVC profile, PVC/PP/PE composite profile, PVC compounding and recycling for PET/PP/PE and other wasted plastics. Made of quality raw material and using world class technology, our machines are widely appreciated for their salient attributes like efficient and consistent performance, lower power consumption, durability and corrosion resistance. With decades of valuable industry experience, we can deliver quality machinery in both standard and customized specifications. In the fast-growing competitive market of plastic machinery, we stand out as a growth oriented company that recognizes the needs of the plastic manufacturing industry and provides comprehensive services including machinery operation and maintenance instructions because of we continuously keep an eye on innovation. To optimize our manufacturing capabilities and elevate our position as a leading manufacturer plastic extrusion and recycling machinery. To innovate excellent, functional and cost-effective plant for multiple extrusion and recycling processes. To provide apt solution for every extrusion and recycling need. ZHANGJIAGANG LANGBO MACHINERY CO., LTD. was established in 2002. Over the past years, we have been offering quality machinery for a wide range of plastic extrusion and recycling processes from China. Plastic extrusion machine: We operates in the manufacturing of plastic extrusion machines and systems for PVC pipe & profile, PE/PPR pipe and so on. Over many years and it is the reliable solution partner from planning and process engineering for the optimum solution through set-up, start-up and operation of extrusion systems. Recycling machine for wasted plastics: We operates in the manufacturing of plastic recycling machines and systems for wasted PET bottle, PP/PE film & rigid scraps in including of washing and recycling pelletizing extrusion and so on. Over many years and it is the reliable solution partner from planning and process engineering for the optimum solution through set-up, start-up and operation of extrusion systems.